Use the Dräger DrugCheck® 3000 to find out within minutes if a person recently consumed certain drugs. The compact and quick saliva (oral fluid) based drug test yields reliable results affordably and easily. The non-invasive drug test kit does not require electricity and can therefore be used anywhere. 5 Drug Version which can test for cocaine, opiates, amphetamine, methamphetamines/designer drugs (e.g. Ecstasy, MDMA) and cannabis (THC). 6 Drug Version which can test for Benzodiazepines, cocaine, opiates, amphetamine, methamphetamines/designer drugs (e.g. Ecstasy, MDMA) and cannabis (THC). 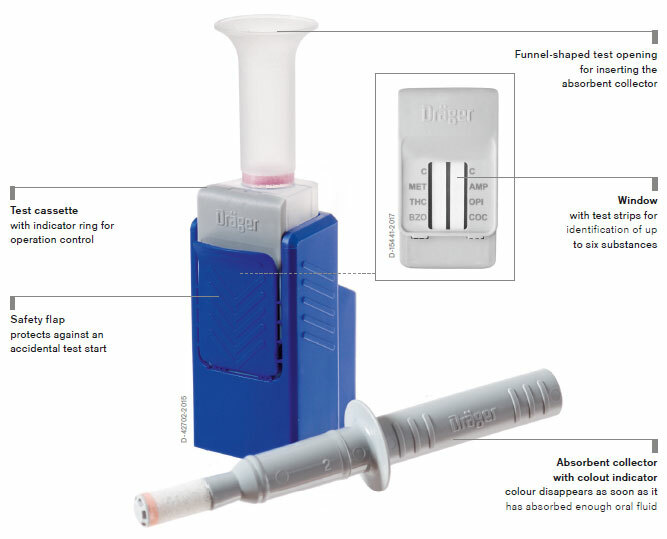 The Dräger DrugCheck 3000 consists of two components: an absorbent collector for obtaining a saliva sample, and a test cassette for the analysis. The test cassette contains the buffer liquid and a window with two test strips, which displays the control and test lines. The drug test itself is performed in three easy steps: swab the saliva sample, shake the test kit, wait for a brief incubation period, and then start the test. A colour indicator on the swab disappears as soon as it has absorbed enough oral fluid for a test. As soon as the control lines appear in the window, you can read the results. If the test result is negative, a line will appear alongside the respective substance class (drug). This means that none of the target substance was detected in the sample. If a line fails to appear next to one of the substance classes, then the result for this substance is positive. Check individuals for up to six substance classes simultaneously with Dräger DrugCheck 3000: cocaine, opiates, amphetamine, methamphetamines/designer drugs (e.g. Ecstasy, MDMA), benzodiazepines (e.g. in prescription medicines) and cannabis (THC). Of all the substance classes listed, cannabis is the drug consumed most frequently and also the most difficult of all compounds to identify (THC = delta-9-tetrahydrocannabinol). This is why the Dräger DrugCheck 3000 was optimised to detect THC, and now offers two measurement options: depending on the chosen waiting time (pre-incubation) of the test there is a fast option with a higher or sensitive option with a low THC cut-off. The entire drug test only takes 3 – 5 minutes. 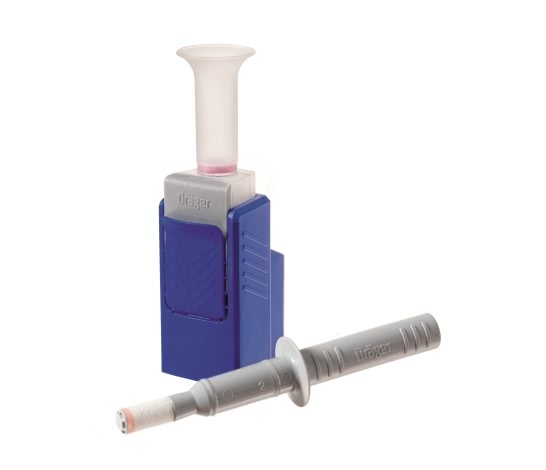 Its compact pocket sized design makes the DrugCheck 3000 easy to transport. It can be made ready for use quickly and easily, and is suitable for flexible use applications such as roadside checks and testing in safety relevant workplaces*. The test kit has no electrical parts, which makes the drug tester safe to use in hazardous areas and even as point-of-care-testing (POCT). Dräger has decades of experience in alcohol measuring equipment and drug detection methods. For the DrugCheck 3000, Dräger employed the testing principle of the proven Dräger DrugTest® 5000 system, which reliably detects even minute traces of THC. The disposable DrugCheck 3000 test kit cannot be manipulated and is hygienic to use.